Whether you are an attorney, manager or student, writing skills are essential to your success. The rise of the information age – with the proliferation of emails, blogs and social networks – makes the ability to write clear, correct English more important than ever. Daily Writing Tips is about that. Every day we publish a new article, with topics ranging from grammar to punctuation, from spelling to usage and vocabulary. Probably the best way to get started is to browse around our most popular posts. We are sure that those will keep you entertained and engaged for hours. If you are looking for a specific topic use the search bar on the right side. 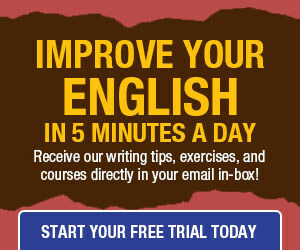 We have a premium subscription available where you will receive our writing tips every day in your email inbox. Premium subscribers also received one interactive exercise every day and get access to our exercise archives with over 800 exercises about grammar, punctuation and vocabulary. Maeve Maddox, Editor: Maeve holds a B.A. (Honours) in English from the University of London and a PhD in Comparative Literature from the University of Arkansas at Fayetteville. Read more of her views on English language and literature, popular culture, and education reform at her site: MaeveMaddox.com. Mark Nichol, Writer: A freelance editor and writer, Mark has worked on editing projects ranging from blog posts and other website content to manuscripts for college textbooks and articles for scholarly journals. A former editing instructor with the Extension program at the University of California, Berkeley, and a onetime schoolteacher, he enjoys reading and writing about language. Ali Hale, Writer: Ali is a freelance writer currently taking a Creative Writing MA at Goldsmiths, London. She has written for several high profile websites, including Problogger, Dumb Little Man and The Change Blog. You can read more from her on Aliventures.com, where she offers an honest take on personal development and getting more from life. Simon Kewin, Writer: Simon is a writer of fiction and poetry. His work has appeared in a wide variety of magazines and anthologies over the years. He has a first class honours degree in English Literature and a huge pile of books waiting to be read. His blog is at Spellmaking.blogspot.com.